The Philadelphia Flyers, everyone's vogue pick for the Cup during the preseason, are in a funk. Third place in the Atlantic and ninth in the conference... and an apparent mess behind the scenes. The Flyers have lost five of their last six games are reeling. Coach John Stevens' job security has been put into question by the media, in the blogsphere and even a recently minted website: FireJohnStevens.net. Then, Chris Pronger and GM take it to the next level by quietly calling out team captain Mike Richards. When the Flyers traded for Chris Pronger at the NHL Draft last summer, general manager Paul Holmgren said that the game's best defenseman would be expected would be vocal in the dressing room. That he’d be someone 24-year-old team captain Mike Richards could lean on during hard times. Pronger told CSNPhilly.com on Tuesday that Richards has not asked for his help and that he is wary of “stepping” on Richards’ toes. Holmgren added that now may be the time for Richards to trust his instincts, but the young centerman appears to be at a crossroads. “Mike is an intelligent young man,” Holmgren said. “He knows that he has experienced guys around him he can lean on if he has to. But I also think he has to trust his gut in certain situations. Maybe that is where he is at a crossroads right now. He has to trust his gut and his instincts. Pronger told CSNPhilly.com he is walking a “tightrope” in the dressing room right now. “He hasn’t asked me for any help,” Pronger said of Richards. “I’ve been in his shoes. It’s not [bleeping] easy. The expectations are high on him and on the team. We’re not playing to the best of our abilities, and a lot of that gets shouldered by the captain. 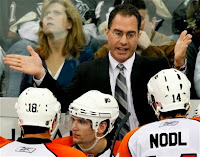 Flyers fans: Blame Stevens, blame Richards if you must, but the problems begin with the GM Holmgren. Why has no one pointed the finger at this guy? 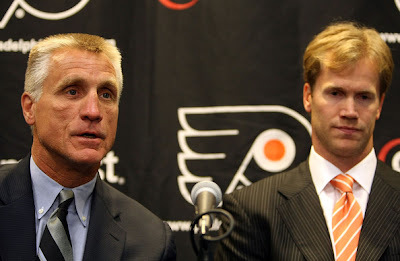 Sure Holmgren has made many good decisions as Flyers GM. He stole Braydon Coburn, and acquired Kimmo Timonen and has made wise draft choices; yet he is most responsible for the current status of the team. It was Holmgren that bought the oft-injured and massively overpaid Daniel Briere. It was Holgren who decided to let Mike Knuble (precisely the kind of player the Flyers need right now) go in the off-season. It was Holgren who over estimated Prongers value (no Mike, he is NOT "the game's best defenseman") when he traded for him and then made matters worse by saddling the team with another huge, long-term contract which Philly will be responsible to pay for when Pronger is in his 40's. It was Holmgren who let go of goaltenders Antero Niittymäki, who has been fantastic in Tampa; and Martin Biron who was spectacular for the Flyers the past two post seasons. It was Holmgren that decided to instead rely his teams' chances on former clubhouse cancer and infamous hot-tempered Ray Emery. Now, it's Holgren that has broken rule number 1: In times of trouble NEVER talk about it to the media! If he believes that the team captain need to step up, great... talk about that behind closed doors. Additionally, why foster an environment for Pronger to publicly speak out about the team struggles? This team is spiraling and there seems to be a loss of focus at every level, but it starts in the front office.